Just as every snowflake in nature is unique, so it can be for your next batch of cupcakes. Have fun experimenting with different designs and colors. Maybe even add some sprinkles, or Wilton Cake Sparkles. What You Need: 1 cupcake (baked and cooled); icing tinted light blue; white frosting in decorating bag and round tip 1, 2 or 3 (or just use a commercially made tube of writing icing). How to Make It: Frost cupcake blue. 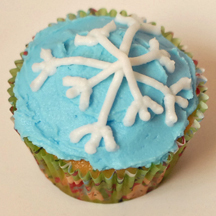 Using fluid motions and even pressure, pipe snowflake shapes onto cupcake. It’s easiest if, for each “line” in your design, you lightly touch the tip to the surface of the cupcake, pull away as you gently squeeze the length of the line, and touch the tip down again to reattach. Be sure to stop squeezing before you pull away. This entry was posted on Friday, December 14th, 2007 at 10:11 pm	and is filed under Christmas cupcakes, winter cupcakes. You can follow any responses to this entry through the RSS 2.0 feed. Responses are currently closed, but you can trackback from your own site.